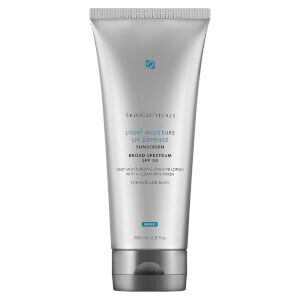 SkinCeuticals Physical UV Defense SPF 30 is a gentle sunscreen specifically formulated for sensitive or traumatized skin types, as well as for children. It combines barrier repair and broad-spectrum UVA/UVB protection and won't cause discomfort or irritation. Ideal for those who want broad-spectrum sun protection that is moisturizing yet oil-free. Active Ingredients: Titanium Dioxide 4.99%, Zinc Oxide 3.99%. Cosmetic Ingredients: Water, Glycerin, C12-15 Alkyl Benzoate, Dimethicone, Butyloctyl Salicylate, Phenethyl Benzoate, Triethylhexanoin, Isohexadecane, Styrene/Acrylates Copolymer, Stearyl Dimethicone, Butyrospermum Parkii (Shea) Butter, Isododecane, Polyglyceryl-4 Isostearate, Talc, Dimethicone/Polyglycerin-3 Crosspolymer, Nylon-12, Pentylene Glycol, Lauryl Peg-9 Polydimethylsiloxyethyl Dimethicone, Aluminum Stearate, Phenoxyethanol, Alumina, Polyhydroxystearic Acid, Magnesium Sulfate, Caprylyl Glycol, Peg-8 Laurate, Disteardimonium Hectorite, Triethoxycaprylylsilane, Tocopherol, Propylene Carbonate, Artemia Extract, Benzoic Acid, Dipropylene Glycol, Sodium Hyaluronate. I have used this product for along time. It came in a 3 FL oz tube . I do not like this in a bottle. I hope you return to the tube.